How do I create a Cleaned to Perfection account? Follow the simple steps when scheduling your cleaning and your account will automatically be created. We service all of Central Suffolk County, from Setauket (North) to Patchogue (South) to Wading River (East) to Dix Hills (West). We stand by our name with our high level of service. While other companies may charge more for little details, they are included in our cleaning service. During our initial baseline cleaning, we clean your home from top to bottom. During our routine visits, we maintain your home to ensure that it’s cleaned to perfection. Extras are available. Additional fees apply. 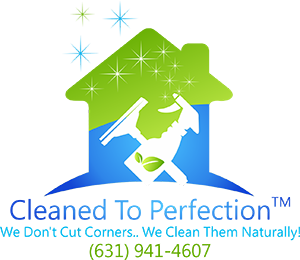 Yes, we provide all environmentally friendly cleaning supplies as well as equipment. If you’d like us to use your cleaning products or equipment, please contact our office for approval prior to your cleaning. What’s your policy for scheduling and rescheduling? We require at least 24 hours notice for cancellations of service. Cancellations must be made by calling 631-941-4607 or e-mailing cleanedtoperfection@gmail.com. By visiting wecleanedtoperfection.com, and select “Request A Schedule Change” page. You will receive a response within one business day of making your cancellation, during business hours Monday-Friday. If you contact us less than 24 hours in advance of your scheduled cleaning to cancel, we will charge a non-refundable fee of $50 to cover a portion of our expenses. Your home will be cleaned between the hours of 8:00AM and 5:00PM on the scheduled cleaning day. We do not schedule set appointment times as part of our Preferred Service. Cleaned to Perfection may charge by the hour for the next cleaning to catch up and allow enough time to perform the job properly. Cleaned to Perfection reserves the right to charge a fee to restart service and to review your service rate. that the client understands that monthly cleanings are scheduled every four weeks. How do you access my home if nobody is home? Please ensure that our staff has access to your home. During the online sign up process, you will be prompted to tell us where to find your key for the initial cleaning if you will not be home. The majority of our clients ask us to keep the key, where we assign it a control number, log it in to our production management system, and store in our key safe. If you choose, we can return the key to the place of your choosing, but Cleaned to Perfection is not responsible for losses due to access arranged this method. we will charge your card a non-refundable lockout fee of $60. you can give us the alarm code (this can be provided as part of the online sign up process), or turn off the alarm system prior to our arrival. Is a tip included in pricing? No. A tip is neither expected nor required. It is completely optional and at your discretion. If you should decide to add a tip with your payment, please let us know how much of your payment is designated as a tip. Otherwise, it becomes a credit towards your next payment. How do we know when the office will be closing during bad weather? Cleaned to Perfection reserves the right to be closed for business when severe weather conditions prevent local school districts from opening. Also, if our office should remain open despite weather related school closings, for our employee’s safety, they too reserve the right to work or not. We will make every effort possible to send another team to perform your cleaning or reschedule your cleaning. If reschedule is not needed or wanted, you will not be penalized for skipping a cleaning. During the summer, our air conditioning is off while we are not home. What are your warm weather guidelines? When required, Cleaned to Perfection’s team members may need to use the air conditioning by lowering the thermostat to a comfortable setting to prevent heat exhaustion, or fainting. How do you ensure the safety of my valuables? To avoid accidental breakage, please secure valuables, fragile collectibles, and irreplaceable family heirlooms. We request that you place these items in a cabinet or drawer, or we can make a note on your dispatch sheet not to touch them. but occasionally accidents do happen. Our cleaning team will follow their “Cleaned to Perfection Damage Procedure.” You will receive a notice and inform you of your damage. The office will follow up with a phone call to determine the best course of action to take for you. due to normal wear and tear, deterioration caused by age or weather, or damage caused by improper assembly, construction or mounting of an item (Ex: blinds, pictures, fan blades, light fixtures, etc.). they do require specialized care. We are unable to maintain them. Clients have 48 hours to report damaged or broken items. After 48 hours, the client assumes responsibility for the broken item. How Do I Prepare My Home When My Children and Pets are Present at the time of cleaning? For safety reasons, please see that children are supervised while we are cleaning your home. Cleaned to Perfection reserves the right to refuse service on the scheduled date if an animal in the home is considered dangerous. Pets left inside the home on the scheduled service date will be protected to the best of our ability. Cleaned to Perfection will not be held responsible for the behavior of the pet(s) while the service is being performed. Do I have to reschedule my cleaning if another contractor is present? Individuals in the home while service is performed must not occupy the rooms while the cleaning is being done. It is requested that you move to other rooms and be mindful of our equipment for your protection and the protection of our employees. which result in a request to re-clean an area the team has already cleaned, will result in an additional fee. What are your cleaning team member regulations? Cleaned to Perfection makes a significant investment in recruiting and training only the most qualified cleaning team members. In consideration of this opportunity, each cleaning team member signs a non-compete agreement, which prohibits him or her from working directly for our clients. We ask that our clients abide by the same measure. By accepting our service you agree neither to solicit, directly or indirectly, nor hire a current or former Cleaned to Perfection cleaning technician who has provided service to your home, without the written consent of Cleaned to Perfection and compensation of $1,500 to Cleaned to Perfection for its loss. Cleaned to Perfection team members are unable to climb on ladders higher than the two-step ladder they are issued to perform their work when needed. Please call the office if you need work performed in your home that requires a ladder. our staff will not handle any type of animal or human waste, vomit, blood or body fluids. we are unable to clean in areas or homes with live infestations (maggots, fleas, roaches, bedbugs, etc.) until mitigated. Either party may cancel cleaning service with written notice. Any payment for above mentioned services owed by the client would be due and payable at the time of cancellation. This is not a contract and either party may cancel service at any time for any reason without penalties or additional fees. How does the deposit and payment policy work? In order to secure your appointment, we place a $50 charge on your credit card. This charge will be put towards your cleaning total. You will be charged the remainder of the balance owed after service has been rendered. If you cancel your appointment less than 24 hours before your appointment, you will have 5 business days to reschedule your appointment. If you fail to reschedule your appointment within 5 business days, the $50 is kept as a late cancellation fee. Can I trust my certified cleaning team? We undergo identity checks as well as in-person interviews. Our company is licensed, insured and bonded. To insure the Payment Card Industry Data Security Standard, we secure all transactions using industry standard SSL encrypted connections end to end. Cleaned to Perfection reserves the right to re-evaluate rates at any time based on the amount of time it takes to perform our services in order to meet our customer’s standards or expectations. We monitor the actual cleaning time for the initial one to three months and occasionally thereafter. Cleaned to Perfection will contact the client to discuss possible price or service revisions if the cleaning time differs significantly from the original cost. Our work is guaranteed; if you think any area that is in our scope of work is not clean or “cleaned to perfection,” we will re-clean to your satisfaction. Please call within 24 hours of your cleaning and we will return as soon as possible within two business days to re-clean the problem area. Requests for re-cleaning submitted after 24 hours will result in a fee. We appreciate the opportunity to make things right in a timely manner. Our guarantee does not include a refund when services have been approved and rendered.